The Galloway Cattle Society has unveiled a new logo to help raise awareness of beef from Galloway cattle. The Real Galloway Beef project seeks to stimulate market demand for meat from the breed, widely considered to be some of the highest quality beef in the world. “This project is about putting the systems in place that mean we can guarantee to members of the public that when they see this logo they are getting beef from Galloway cattle, rather than beef that has been reared in Galloway. There’s a lot more to this than just a logo. Behind it will be a robust Quality Assurance scheme that we are introducing early next year, and we’re keen to hear from retailers and supply chain partners who want to work with us to become ambassadors for the breed. “This is an exciting time for the Galloway. Interest in native breeds and grass fed beef is soaring as members of the public are perhaps eating beef less often, but when they do they want the best. The Galloway is unequivocally one of the best beef breeds in the world, and it thrives in our local landscapes. The launch marks the start of a two year project called Defining Galloway Beef part funded by Dumfries and Galloway’s LEADER programme to develop a new project to promote Galloway Beef and to encourage more farmers to think about stocking Galloways. The project will include the development and launch of a Quality Assurance and traceability scheme, it will support young farmers and new entrants learning journey delegations to attend three international cattle events, develop an education toolkit for schools and will seek supply chain partnerships to improve consumer access to Galloway Beef. Thirteen year old McKenzie Ross of Romesbeoch Farm in Shawhead handled prize winning Galloway bullock Jock during the launch. 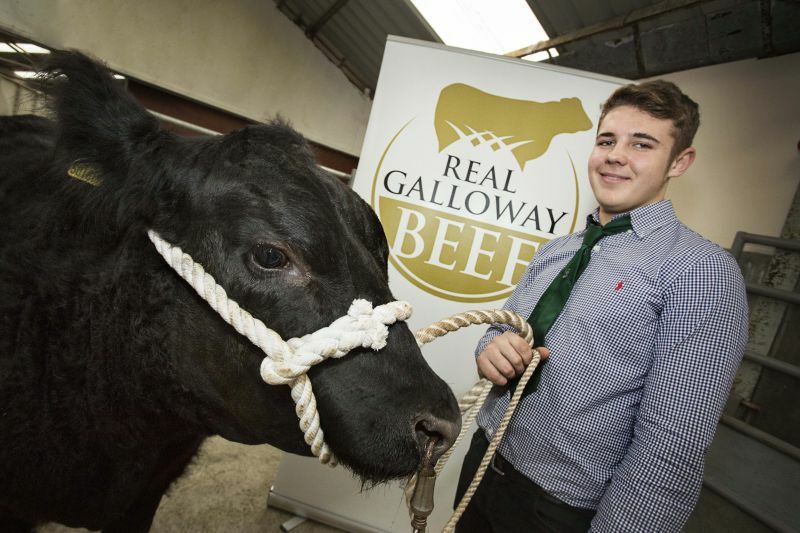 McKenzie, who attends Castle Douglas High School, has been showing Galloways since he was six years old and is one of the next generation of young farmers that the Galloway Cattle Society want to encourage with this project. “I’ve been brought up with Galloways since the day I was born and I would like to farm them when I’m older. I like the power and the shape of Galloways and I like the personality of the breed - some can be really friendly and others can be very stubborn. Butchers, retailers, restaurants and other supply chain partners who are interested in becoming Galloway Beef Ambassadors as part of the new Quality Assurance Scheme are being encouraged to contact the Galloway Cattle Society to register their interest on info@gallowaycattlesociety.co.uk . Photo: Attached photo shows McKenzie Ross with prize winning Galloway Jock. The Galloway Cattle Society was established in 1877 and is tasked with responsibility for protecting, managing and growing the Galloway cattle breed. The Galloway is one of the oldest and purest of Scotland’s native cattle breeds. The beef from Galloway cattle has some distinct properties which are a direct result of their breed, including marbling of fat through the meat and balance of omega oils. Galloway Beef is widely considered to be a premium meat, yet at present it rarely commands a premium price at the farm gate.